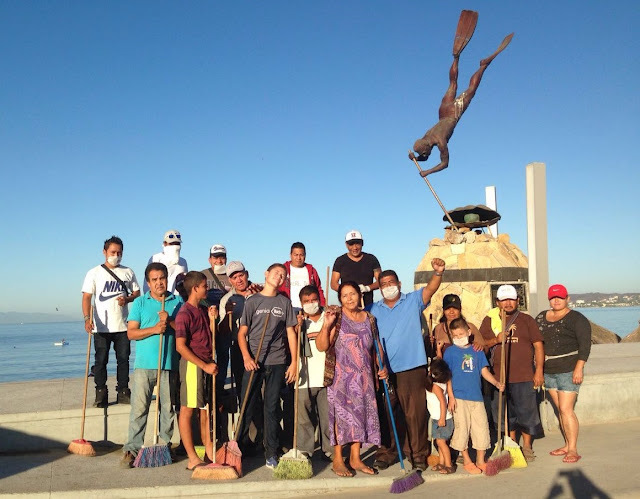 Over 220 people embarked on a cleanup along the perimeter of Banderas Bay and several other locations in the Riviera Nayarit including Punta de Mita, Sayulita, the Islas Marietas and La Peñita de Jaltemba, among others. In order to commemorate Earth Day—celebrated this year on Friday, April 22nd—the Central Pacific and Western regional arm of the National Commission on Protected Areas (Conanp by its acronym in Spanish) called for a massive cleanup, which took place on Saturday, April 23rd in the Riviera Nayarit. “Our Environmental Programs desk has been working hand-in-hand with the Conanp and other authorities from the three levels of government, civil associations, hotels and the business sector on this massive cleanup and other endeavors in order to get things done,” declared Marc Murphy, Managing Director of the Riviera Nayarit Convention and Visitors Bureau. The Banderas Bay City Council was also a part of the activities that took place specifically in Valle Dorado, Bucerías, La Cruz de Huanacaxtle, Higuera Blanca, Punta de Mita, Corral del Risco, Sayulita, San Pancho, Lo de Marcos, Rincón de Guayabitos and La Peñita de Jaltemba. The call to action attracted over 220 people to the cleanup, 60 of whom formed part of the brigade that worked on the Islas Marietas. Participating hotels and hotel chains included the Hard Rock Hotel Vallarta, Hoteles Marival, Grand Palladium, Hoteles Riu and the Iberostar Playa Mita. A group of civil associations was also involved, including the Peace Corps, the Punta Mita Foundation, the Grano de Arena Foundation, the Corral del Risco Co-op and Amigos de Bucerías.